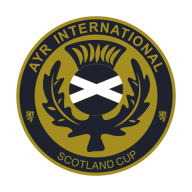 We are currently accepting applications for the 42nd Ayr International Scotland Cup. The deadline for applications is March 29th 2019 at 15:00. We are currently accepting applications for the 28th Land O'Burns Scotland Cup. The deadline for applications is to be confirmed. To apply for a place in one of the Scotland Cup tournaments complete the application form in our 2019 Brochure which can be found attached below. We accept scanned forms sent via email to info@scotlandcup.com or written applications sent by mail to Scotland Cup Office, 15 Highhouse View, Auchinleck, Ayrshire KA18 2LD, Scotland - All applications must be sent in with full payment. Further details can be found on the application form. Team conformations will be sent out after the application closing date.